Founded in 2005, Kilchoman is Islay’s first new distillery in over 125 years and claims to be the only Scotch whisky producer to carry out every element of the whisky making process on site, from barley growing through to malting and bottling. 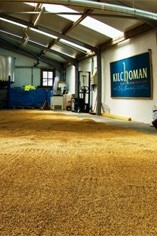 Kilchoman is one of the smallest distilleries in Scotland with an annual production of 90,000 litres of alcohol. It is the only inland distillery on the Island and is one of only six distilleries in Scotland to have its own floor maltings. However the key difference at Kilchoman is that the barley is grown on the farm at the distillery, whereas other distilleries purchase barley from around the country.